This weekend, I was a crazy person with the sewing machine! On Saturday, I started making a set of napkins. I bought this pretty floral fabric at Ikea when Marmee and Holly were here and decided to finally use it. 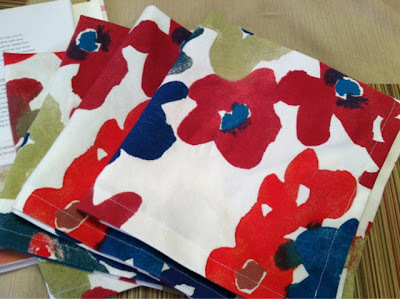 If you recall, I made one set of napkins (a set of six, I believe) when I first got my machine. I decided that we needed another set. I'd like to move toward using the cloth napkins more frequently on a daily basis. We'll see how it goes. Anyway, I got these particular instructions out of a wonderful sewing book I bought a couple of months ago. If you are thinking about getting into sewing, you need to look into this book. It's called Stitch by Stitch by Deborah Moebes. The book is set up in such a way that everything is made very clear: tools, supplies, methods, etc. It starts with small projects to build skills and works up to more complex projects. I really like it. After making the napkins, I followed her instructions to make a lovely little bag. The method BLEW MY MIND. I wish I could explain it, but I just can't. I made the bag in less than three hours. Three hours! That's from cutting fabric, to the final topstitch. It was ridiculous. In a really good way. It made me feel really confident and good about my budding sewing skills. I think that's a pretty good thing. 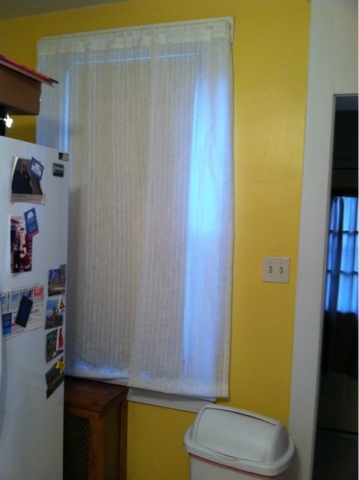 I also decided that it was time to shorten the curtain that we have hanging on one of our windows in our kitchen. It was MUCH too long and had been driving me crazy since I hung it (and of course, I didn't take a before picture). I lived with it for a great deal of time and decided that it was time to take action. I talked to my mom about it a bit, to find out what she suggested for the hem. She suggested three inches. I measured and marked where I wanted the curtain to fall and then added three inches and... chopped. Yikes. It wasn't the most even of cuts, but I rolled with it, hemmed it, and hung the curtain back up. I think it looks marvelous, if I do say so myself. It makes a huge deal, bigger than I thought it could. Yay curtains!